Imagine having the first “real” news story you ever published picked up by a major global news source like Quartz. That’s what happened Kevin Sun, ’17 M.S. Data Concentration, after he left a career in software development. 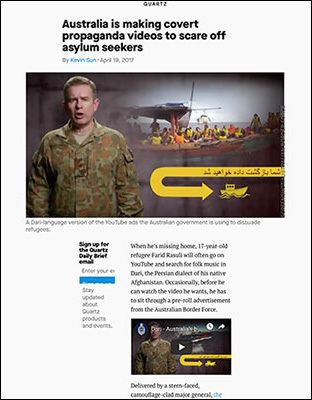 As part of his coursework, Sun reported on how the Australian government is financing YouTube advertisements aimed at discouraging migrants from seeking asylum in that country. The story was published by Quartz while Sun was still a student. 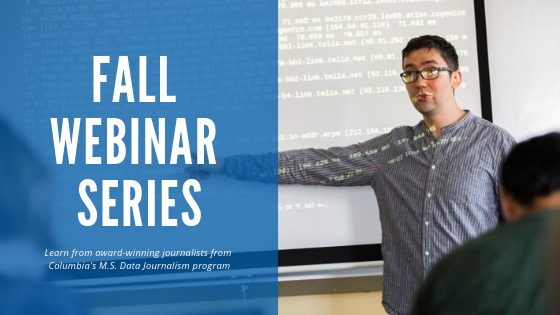 Here, he talks about the J-School professors and classmates who helped him develop the story – and how reaching out to the alumni network helped get it published. The story was written for International Newsroom: Reporting of Refugees, taught by Ann Cooper and Susan McGregor in Spring 2017. During a Q&A in class, one of the guest speakers brought up the trend of “extraterritorialization” of refugee crises – e.g. how Europe has forced many potential asylees to stay in Turkey, or how the US has done so with Mexico or how Australia has done so with Indonesia. That comment piqued my interest in Australian refugee policies, which I knew relatively little about, and I began digging through Australian government websites for more information. Eventually I got access to thousands of pages of documents regarding numerous information campaigns the Australian government has run in Indonesia and other countries throughout the years to discourage potential asylum seekers. Did your classmates, professors or other Columbia resources help develop the story? Class discussion with the professors and classmates helped me narrow down the focus of my story from “Australian information campaigns” in general to the more specific topic of “Australian government-sponsored Youtube ads." The Columbia libraries were an invaluable resource for finding books on relevant subjects such as refugee detention in Indonesia and Australia-Indonesia relations – I ended up reaching out to the authors of several books I found in Lehman and Butler. What skills from your coursework did you use in your reporting? Using social media to find sources was crucial for this story (and all stories I wrote in this class, since we were covering international issues while based in NYC). By contacting the administrators of one of many “Afghans in Indonesia” Facebook groups, I was able to find a source on the ground in Indonesia who had seen Australian government ads himself while browsing Youtube. I also used some basic programming and webscraping to determine how many different languages the Australian government was producing videos in, and how many total views ads in each language received. How did you connect with an editor at Quartz? Initially I emailed pitches@qz.com, and received an automated response that Quartz was temporarily not accepting pitches due to a large backlog. However, Ann Cooper recommended I reach out directly to a former Columbia grad at Quartz, Jackie Bischof, who then forwarded my story to Georgia King, a Quartz Ideas editor who was herself from Australia – perhaps part of the reason my story resonated with her. What advice would you share with journalism students hoping to be published with Quartz or similar publications? Based on my sample size of one, knowing who to contact seems to be the key. In addition to getting contacts from professors, sharing editor contacts among fellow journalists is very helpful – the alumni from my class have a closed Facebook group that is often used for this purpose. And if your story speaks to a particular editor personally (as may have been the case with my story), that’s even better. This was... a significant milestone for me professionally. It gave me an accomplishment to point to when meeting potential employers. What impact has the story's publication had on your life and career? Since I was coming into journalism from an unrelated career path, this was the first story I had ever had published in a 'real' publication, making it a significant milestone for me professionally. It gave me an accomplishment to point to when meeting potential employers – especially at the job expo. Speaking of the job expo, that was where I first met the editors of The Real Deal, the NYC real estate magazine where I was hired as a data journalist a year later.